The Cao Dai Great Temple at the sect’s Holy See is an amazing and remarkable structure in Asia. Built between 1933 and 1955, the temple is a rococo extravaganza blending the dissonant architectural motifs of a French church, a Chinese temple and an Islamic mosque. Tay Ninh province, northwest of HCMC, is bordered by Cambodia on three sides. The area’s dominant geographic feature is Nui Ba Den (Black Lady Mountain), which towers above the surrounding plains. 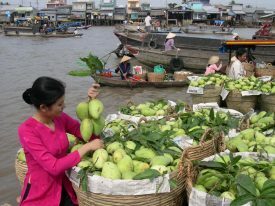 Tay Ninh province’s eastern border is formed by the Saigon River. 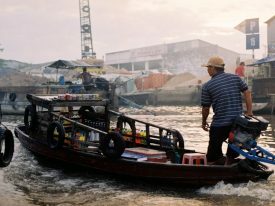 There is a river whose name is the Vam Co River flows from Cambodia across the western part of this . Because the political and military of the Cao Dai used to be vaunted , this region was the scene of prolonged and heavy fighting during the Franco-Viet Minh War. Tay Ninh province served as a major terminus of the Ho Chi Minh Trail during the American War, and in 1969 the Viet Cong captured Tay Ninh town and then held it for a long time . During the period of conflict between Cambodia and Vietnam in the late 1970s, the Khmer Rouge launched many cross-border raids into Tay Ninh province and committed atrocities against civilians. A number of cemeteries around Tay Ninh are stark reminders of these events. 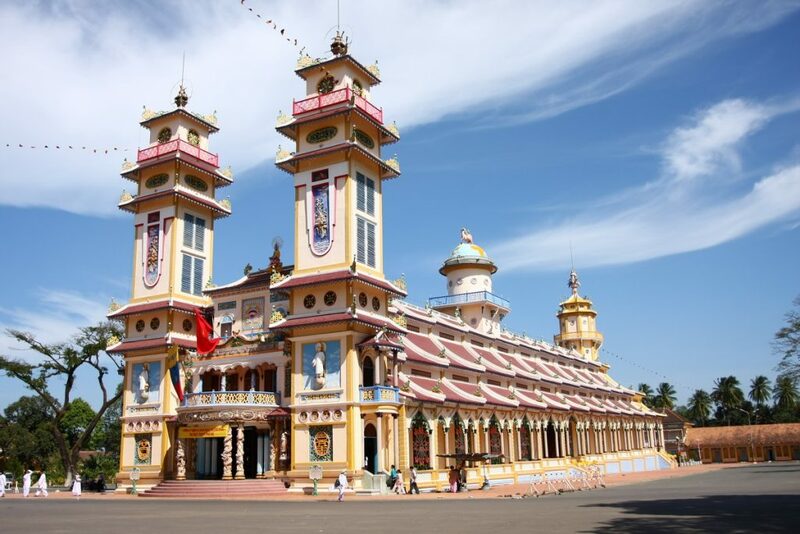 Home to the Cao Dai Great Temple (Thanh That Cao Dai), the Cao Dai Holy See, established in 1926, is 4km east of Tay Ninh, in the village of Long Hoa. 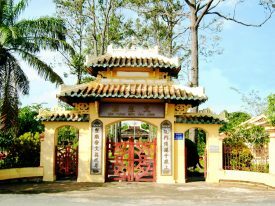 Like the Great Temple, the complicated houses administrative offices, residences for officials and adepts, and a hospital of traditional Vietnamese herbal medicine that appeals to many people from all over the south for its treatments. After reunification the government took parts of the complex for its own use (and perhaps to keep an eye on the sect). Prayers are conducted four times daily in the Great Temple (suspended during Tet). It’s better for visitors to visit during prayer sessions (the one at noon is most popular with tour groups from HCMC) but don’t disturb the worshippers. Only a few hundred adherents, dressed in splendid garments, join in weekday prayers but during festivals many thousand may visit . The Cao Dai clergy have no objection to travellers taking photos of temple objects, but remember not to photograph people without their permission, which is rarely respectful . However, you can photograph the prayer sessions from the upstairs balcony, an apparent concession to the troops of visitors who visit daily. Visitors should wear modest and respectful attire inside the temple, which means do not wear shorts or sleeveless T-shirts. Set above the front portico of the Great Temple is the divine eye. Lay women enter this temple through a door at the base of the tower on the left. Once inside they walk around the outside of the colonnaded hall in a clockwise direction. Men will come into the hall on the right and walk around the hall in an anti clockwise direction. People have to remove hats when to enter the building. The area in the centre of the sanctuary is reserved for Cao Dai priests. A mural in the front entry hall represents the three signatories of the ‘Third Alliance between God and Man’: the picture showing the Chinese statesman and revolutionary leader Dr Sun Yat-sen (Sun Zhongshan; 1866–1925) holds an ink stone, while the Vietnamese poet Nguyen Binh Khiem (1492–1587) and French poet and author Victor Hugo (1802–85) write ‘God and humanity’ and ‘Love and justice’ in Chinese and French (Nguyen Binh Khiem writes with a brush, Victor Hugo uses a quill pen). There are signs in each offer a little bit different version of the fundamentals of Cao Daism. The main hall is divided into nine sections by shallow steps, illustrating the nine steps to heaven, with each level marked by a pair of columns. Worshippers attain each new level depending on their years as Cao Dai adherents. At the far end of the sanctuary, eight plaster columns entwined with multicoloured dragons support a dome representing the heavens. Under the dome is a giant star-speckled blue globe with the ‘divine eye’ on it. There is the biggest of the seven chairs in front of the globe is reserved for the Cao Dai pope , a position that has remained vacant since 1933. The next three chairs are for the three men important for the religion’s law books. The rest are for the leaders of the three branches of Cao Daism, represented by the colours yellow, blue and red. Up near the altar are unclear portraits of six figures important to Cao Daism: Sakyamuni (Siddhartha Gautama, the founder of Buddhism), Ly Thai Bach (Li Taibai, a fairy from Chinese mythology), Khuong Tu Nha (Jiang Taigong, a Chinese saint), Laotse (the founder of Taoism), Quan Cong (Guangong, Chinese God of War) and Quan Am (Guanyin, the Goddess of Mercy).